Welcome to The Riding Academy's Riding Program. 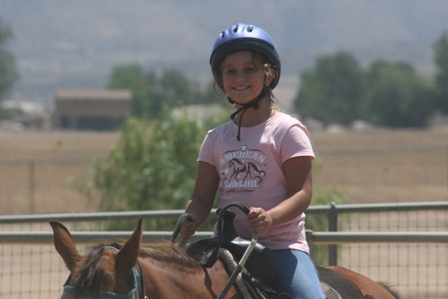 Our Ranch is located in Menifee, Ca. at 30300 Garbani Road. Menifee is less then 5 minutes from Murrieta, Sun City and Hemet. Our Group lessons include Equine Science 1 program. Private and semi-private lesson students have a choice if they would like to be in the Equine Science 1 program. Group classes are normally offered Saturday mornings and weekday afternoons. Complete Lesson Schedule We do give discounts to students that take Vaulting Lessons and Riding Lessons. From time to time we have large families or friends that would like to ride together. We can schedule a special day and time for groups of 5 or more or even for a small group of 2. 3 or 4. We maybe able to include younger riders in these classes. Private and semi-private lessons are offered six days a week at various times. Make Up Lesson Policy You can do make up classes! We offer several different opportunities to our students and parents that would like to be more involved.